BURBANK, CA (June 28, 2012) -Two parallel universes continue to collide as mysterious forces work to overwrite the laws of physics in the release of Fringe: The Complete Fourth Season from Warner Home Video (WHV). The critically acclaimed fourth season of television's most thrilling sci-fi series features 22 mind-bending episodes with over two hours of brand new special features, including two Blu-rayTM exclusive featurettes, and an offer for a free 23-page digital comic. Ranking #1 in its Friday time period (Fridays 9/8c FOX) among Men 18-34, 18-49 (tied) and Males 12-34, Fringe continued to be a solid performer among fans and to generate widespread critical acclaim in its fourth season. [Ratings source: Nielsen Media Research, Live+7 Day data.] 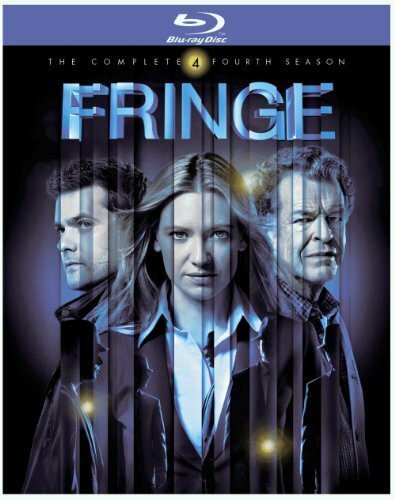 Fringe: The Complete Fourth Season comes to DVD and Blu-rayTM for the first time September 4, 2012 for $59.98 / $69.97 SRP. Set in two parallel universes, the FBI's Fringe Division investigates unusual incidents that defy explanation. When unimaginable events threaten existence on a universal scale, Special Agent Olivia Dunham, eccentric fringe scientist Walter Bishop and his alternate-universe born son, Peter, continue their mission to heal the rifts between the two worlds. To complicate matters further, Peter has mysteriously returned to a universe in which he never existed - a virtual stranger to the Fringe team - while a God Complex-driven madman is crossing between realities with an absolute endgame in mind that will destroy both worlds! Wrestling with questions of identity, destiny and existence, the Fringe team must not only struggle to reset their reality and find each other again, but save both universes...by sacrificing more than one of their lives! "Following the critically acclaimed fourth season, Warner Home Video is thrilled to release Fringe: The Complete Fourth Season on DVD and Blu-rayTM," said Rosemary Markson, WHV Senior Vice President, TV and Special Interest Marketing. "This year, in addition to two hours of never-before-seen special features, our Blu-rayTM release will feature exclusive content and a free HD digital copy offer for all 22 episodes." Created by J.J. Abrams (Lost, Star Trek, Super 8), Roberto Orci and Alex Kurtzman (Hawaii 5-0, Star Trek, Transformers films), the fourth season of Fringe stars Anna Torv (The Pacific), Joshua Jackson (Dawson's Creek), Lance Reddick (Lost, The Wire), Blair Brown (Altered States), Jasika Nicole (She's Out of My League), Seth Gabel (The Da Vinci Code) and John Noble (The Lord of the Rings films). Fringe is produced by Bad Robot Productions in association with Warner Bros. Television and its executive producers include Abrams, Jeff Pinkner (Lost, Alias), J.H. Wyman (The Mexican, Keen Eddie), Bryan Burk (Star Trek, Lost) and Joe Chappelle (CSI: Miami, The Wire). Kurtzman, Orci and Akiva Goldsman (A Beautiful Mind) serve as consulting producers. Fringe returns for its fifth and final season on September 28, 2012, airing Fridays at 9/8c on FOX. *	BLU-RAYTM EXCLUSIVE - Ultraviolet copy of all 22 episodes!